This document describes the camera extensibility features of ESP. The camera system is highly customizable and extensible, enabling add-on providers to create interesting and useful views. There is a distinction between the view system and the camera system. The view system manages the 3D windowing system by tracking the active window, processing keyboard and mouse input and providing methods for opening new windows, selecting windows, etc. The camera system defines what appears in each view window. The simulation loads a set of global camera definitions from CAMERAS.CFG located in the user’s application data folder (%APPDATA%\Microsoft\ESP). This file is copied from the ESP root folder the first time a new user launches ESP or whenever the file cannot be found in the application data folder (if it was deleted or moved). You can also define cameras that specific to a flight or mission. As with aircraft cameras these are defined in the .FLT file using the same definition format. When a user loads a flight or mission any existing flight-specific cameras are removed and new ones are added. Refer to the Mission Creationdocumentation. • Cockpit – Camera is locked at fixed position in the 2D cockpit. Forward views include 2D instrument panel. Oblique view angle show virtual cockpit interior. 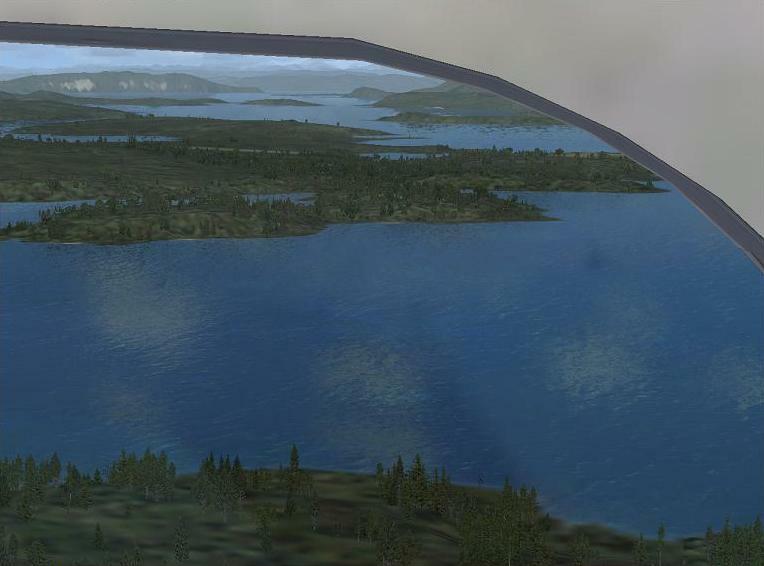 • Virtual Cockpit – Camera is mounted at the eye point defined in the aircraft’s CFG file. • Center – External (spot plane) camera that points at the center of the aircraft’s visual model. • Pilot – External (spot plane) camera that points at the pilot position inside the aircraft’s visual model. • Tower – External camera mounted at a control tower defined via the facilities (BGLCOMP) database. • Fixed – External camera at a fixed position. Fixed camera definitions must include FixedLatitude, FixedLongitude and FixedAltitude values. • WorldObject – Used by SimConnect clients. Not available through CFG settings. Orthogonal These settings control how camera movement is handled when the camera system receives a view pan or “snap to” command. • None – Commands are ignored (position remains fixed). • Ordinal – Camera moves to the next ordinal compass position in the direction of the command. • Swivel – Camera moves incrementally in the direction of the command. • Orthogonal – Camera rotates in the direction of the command (used in top-down view). • None – No tracking behavior. User has manual control over the camera. • FlyBy – Fly-by mode; the camera is positioned away from the user aircraft (at a location given by ChaseDistance, ChaseAltitude and ChaseHeading values) and tracks the aircraft for ChaseTime seconds before computing a new position. • Track – Camera tracks the object while maintaining its position. • TrackBank – Camera tracks the object while maintaining its position. • FlatChase – Camera moves with the object, maintaining a fixed distance from it. Camera movements are dampened. Defaults: 0.0 Camera XYZ position offset from the default location in meters. See C172Cameras example. Defaults: 0.0 Camera pitch, bank and heading orientation offset from the default in degrees. Note that positive pitches give a downward view. Positive headings are to the right. See C172Cameras example. • Normal – The near clip plane is scaled along with the zoom level. Useful for most views. • Minimum – Clamps the near clip plane at its absolute minimum value (1 meter). Useful for cameras where the camera is placed close to object geometry (e.g., aircraft cameras). • Spot – Favors distant objects by scaling the near clip plane with altitude and distance. Useful when the camera is positioned a reasonable distance away from the target object (e.g., spot view). • Tower – Favors near objects by scaling the near clip plane by one-half the zoom level and clamping the far plane based on visibility settings with an absolute limit of 20km. Useful when objects at the limits of visibility aren’t important. Default: 0.0 For Fixed camera types, the latitude of the cameras position. See FixedCameraTest. For Fixed camera types, the longitude of the cameras position. See FixedCameraTest. For Fixed camera types, the altitude of the cameras position in meters. See FixedCameraTest. The ESP camera system can compute acceleration parameters to simulate head movement. The effect is controlled by settings in the ESP.cfg file, which can be found in the C:\Documents and Settings\<alias>\Application Data\Microsoft\ESP folder (for Windows XP), or the C:\Users\<user name>\AppData\Roaming\Microsoft\ESP folder (for Windows Vista). The simulation uses these settings to compute how much camera acceleration (pitch, roll, side-to-side, and fore-to-aft) is generated in relation to aircraft accelerations. The table below describes each setting. Note that negative numbers move the camera in the opposite direction to the acceleration. The SDK includes several example files that you can use to observe how changes to camera configuration settings affect behavior. Copy the .FLT files to the My Documents\ESP Files folder and then load them in ESP. This flight defines six cameras that appear in the “Custom” category with different pan rate settings. Pan the view with the joystick hat switch or numeric keypad (with NumLock selected). These cameras also feature smooth transitions. Select one of the cameras from the Views menu and then press the A key to cycle through each position.